Geoffrey Blodgett. 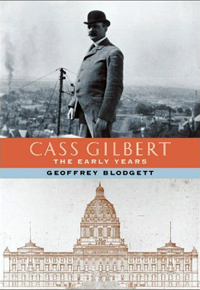 Cass Gilbert: The Early Years (Saint Paul: Minnesota Historical Society Press, 2001). A highly readable account of Gilbert’s life and career before his move to New York. Barbara Christen and Steven Flanders, eds. 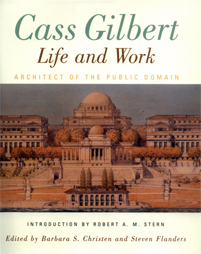 Cass Gilbert Life and Work: Architect of the Public Domain (New York: W. W. Norton, 2001). The most comprehensive assessment to date of Gilbert’s career from a variety of perspectives. Essays by nineteen authors, expanded from presentations at a symposium held in New York City in November 1998. Barbara S. Christen. “Patronage, Politics and Civic Identity: The Development of Cincinnati’s Union Central Life Insurance Company Building.” Ohio Valley History 9 no. 2 (Summer 2009): 54-77. William A. Coles. “The History of America’s Greatest Fountain: The Scott Memorial Fountain on Belle Isle, Detroit.” Classical America 3 (1973): 5-26. Patty Dean. "Unique and Handsome': Cass Gilbert's Designs for the Montana Club." Drumlummon Views. (Spring-Summer 2006): 158-176. Patty Dean’s article on Cass Gilbert’s Montana Club, available online in the Drumlummon Views http://www.drumlummon.org/images/PDF-Spr-Sum06/DV_1-2_Dean.pdf, is also available in a handsomely illustrated offprint available for $6.50 through the Drumlummon Institute, www.drumlummon.org/html/Unique-Handsome.html. Kathryn B. Eckert. Buildings of Michigan (New York: Oxford University Press, 1993). Gail Fenske. “The ‘Skyscraper Problem’ and the City Beautiful: The Woolworth Building.” (Ph.D. diss., Massachusetts Institute of Technology, 1988). A scholarly and contextual assessment of Gilbert’s most famous building. Gail Fenske. The Skyscraper and the City: The Woolworth Building and the Making of Modern New York (Chicago: University of Chicago Press, 2008). This expands and refines the content and analysis of Fenske’s Ph.D. dissertation. Margaret Heilbrun, ed. Inventing the Skyline: The Architecture of Cass Gilbert (New York: New-York Historical Society and Columbia University Press, 2000). A beautifully illustrated collection of essays, published in conjunction with an exhibit of Gilbert’s work at the New-York Historical Society. Jeffrey A. Hess and Paul Clifford Larson. St. Paul’s Architecture: A History (Minneapolis: University of Minnesota Press, 2006). Sharon Irish. "A ‘Machine That Makes the Land Pay’: The West Street Building in New York." Technology and Culture 30 (April 1989): 376-397. Available at JSTOR. Sharon Irish. 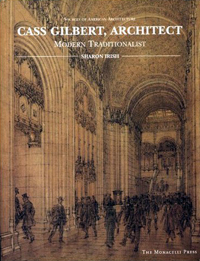 Cass Gilbert Architect: Modern Traditionalist (New York: Monacelli Press, 1999). The first published monograph on Gilbert and his work. Robert A. Jones. Cass Gilbert: Midwestern Architect in New York (New York: Arno Press, 1982). Reprint of Jones’s Ph.D. diss., Case Western Reserve University, 1976. Paul Clifford Larson. Cass Gilbert Abroad: The Young Architect’s European Tour (Afton, Minn.: Afton Press, 2002). Letters and sketches from Gilbert’s first European tour. Library of Congress. Photos and Data pages for Ives Memorial Library http://loc.gov/pictures/item/ct0440/. Library of Congress. Photos and Data pages for A. J. Seligman House http://loc.gov/pictures/item/mt0024/. Library of Congress. Photos and Data pages for West Virginia Capitol http://loc.gov/pictures/item/wv0104/. Larry Millett. Lost Twin Cities (Saint Paul: Minnesota Historical Society Press, 1992). Larry Millett. AIA Guide to the Twin Cities (Saint Paul: Minnesota Historical Society Press, 2007). Patricia A. Murphy. “The Early Career of Cass Gilbert, 1879 to 1895.” (M.A. Thesis, University of Virginia, 1979). A pioneering scholarly work on Gilbert’s early career. National Register of Historic Places, Nomination Form for Battle Hall, South Mall, University of Texas campus 1970 Text: http://pdfhost.focus.nps.gov/docs/NRHP/Text/70000763.pdf (PDF), Photos: http://pdfhost.focus.nps.gov/docs/NRHP/Photos/70000763.pdf (PDF). NOTE: As of 8/2010, this record had not yet been digitized. National Register of Historic Places, Nomination Form for New Haven Railroad Station (1975) Text: http://pdfhost.focus.nps.gov/docs/NRHP/Text/75001941.pdf (PDF), Photos: http://pdfhost.focus.nps.gov/docs/NRHP/Photos/75001941.pdf (PDF). National Register of Historic Places, Nomination Form for Waterbury Municipal Center Complex, including City Hall and Chase Brass and Copper Building (1978); Text: http://pdfhost.focus.nps.gov/docs/NRHP/Text/78002882.pdf (PDF), Photos: http://pdfhost.focus.nps.gov/docs/NRHP/Photos/78002882.pdf (PDF). National Register of Historic Places, Nomination Form for the Woolworth Building (1978); Text: http://pdfhost.focus.nps.gov/docs/NHLS/Text/66000554.pdf (PDF), Photos: http://pdfhost.focus.nps.gov/docs/NHLS/Photos/66000554.pdf] (PDF). Northwest Architectural Archives, Manuscripts Division. "Cass Gilbert Collection." Collection contains studies of the University of Minnesota campus plans and plans for the Roselawn Cemetery. The collection is located at 213 Elmer L. Andersen Library, University of Minnesota, 222 21st Avenue South, Minneapolis, MN 55455. Finding aid: http://special.lib.umn.edu/findaid/xml/naa015.xml. Thomas O’Sullivan. North Star Statehouse: An Armchair Guide to the Minnesota State Capitol (Saint Paul: Pogo Press, 1994). This book focuses on the artworks found in the State Capitol. Ernest R. Sandeen. St. Paul’s Historic Summit Avenue (1974. Reprint, Minneapolis: University of Minnesota Press, 2004). Neil B. Thompson. Minnesota's State Capitol: The Art and Politics of a Public Building (1974. New edition, Saint Paul: Minnesota Historical Society Press, 2004). Samuel G. White. The Houses of McKim, Mead & White (New York: Rizzoli, 1998).